When the rusty cargo ship carrying Mahindan and five hundred fellow refugees reaches the shores of British Columbia, the young father is overcome with relief: he and his six-year-old son can finally put Sri Lanka’s bloody civil war behind them and begin new lives. Instead, the group is thrown into prison, with government officials and news headlines speculating that hidden among the “boat people” are members of a terrorist militia infamous for suicide attacks. As suspicions swirls and interrogation mounts, Mahindan fears the desperate actions he took to survive and escape Sri Lanka now jeopardize his and his son’s chances for asylum. Told through the alternating perspectives of Mahindan; his lawyer Priya, who reluctantly represents the migrants; and Grace, a third generation Japanese-Canadian adjudicator who must decide Mahindan’s fate, The Boat People is a high-stakes novel that offers a deeply compassionate lens through which to view the current refugee crisis. 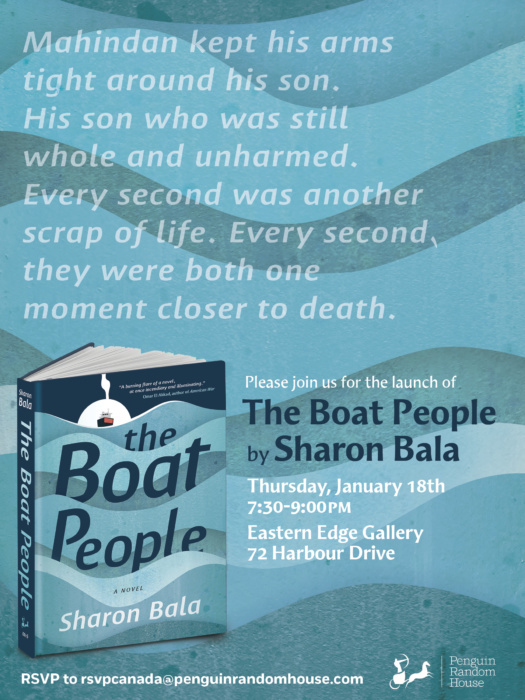 Inspired by real events, with vivid scenes that move between the eerie beauty of northern Sri Lanka and combative refugee hearings in Vancouver, where life and death decisions are made, Sharon Bala’s stunning debut is an unforgettable and necessary story for our times. 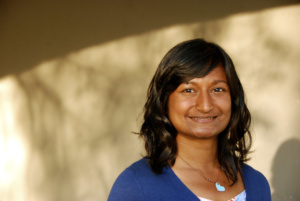 Sharon Bala is trapped on a rock in the cold North Atlantic. Please send mangoes. Her debut novel, The Boat People, was published by McClelland & Stewart and Doubleday US in January, 2018. The manuscript won the Percy Janes First Novel Award (May 2015) and was short listed for the Fresh Fish Award (October 2015). In 2017, she won the Journey Prize and had a second story long-listed in the anthology. A three-time recipient of Newfoundland and Labrador’s Arts and Letters award, she has stories published in Hazlitt, Grain, The Dalhousie Review, Riddle Fence, Room, Prism international, The New Quarterly, Journey Prize 29, and in an anthology called Racket: New Writing From Newfoundland (Breakwater Books, Fall 2015). Sharon is a member of the Port Authority writing group. They can be found every second Tuesday swapping fiction in the closet of a store room on Memorial University’s campus. In her past lives, she worked in PR, event planning, and enjoyed a brief stint as a British housewife. Today, she earns her bread with words. She’s available to write articles and essays, adjudicate competitions, for readings, manuscript evaluations, and editorial aid. Sharon was born in Dubai, raised in the 905, and now lives in St. John’s, Newfoundland with her husband, the mathematician Tom Baird.